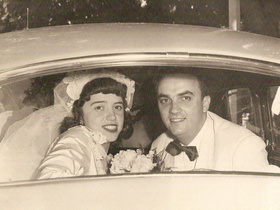 Pierre married Elizabeth" Betty" Chardenet in 1948, a second generation French woman whose father, Auguste Chardenet, employed Pierre during his short stint at the Waldorf Astoria. Family was always at the center of his life. Pierre cooked for his own home wedding, preparing roast fillet of beef with truffles, braised endives, celery root purée, followed by a cheese course which included Epoisses his favorite Burgundian cheese. For his bride, there was chocolate and strawberry mousse, champagne and caviar. Together in Valley Stream and East Hampton, NY, they raised three children: Claudia, Diane, and Jacques. 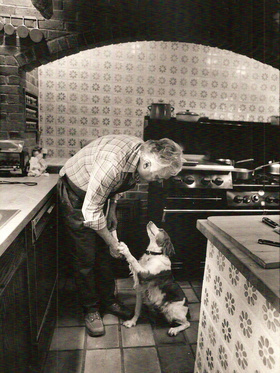 Even during his most productive decades of cooking, Pierre spent weekends, vacations and holidays hunting, fishing, clamming, skiing, gathering mussels,tending the vegetable garden, smoking fish and creating recipes for the next newspaper column, book or newsletter. As they worked side by side in the kitchen, Craig stood at his typewriter carefully documenting Pierres creations while insisting on accurate measurements. Saturday night dinners at Craigs home on Gardiners Bay often became the source for the Times Sunday magazine pieces. Frequent guests included locals as well as artists, authors, celebrities and chefs from around the world. Birthdays, weddings, holidays, family picnics and clambakes were all planned and executed by Pierre and Craig with fellow chef friends often arriving with homemade patés, a saucisson, or crusty French baguettes and hunks of cheese. Renowned chefs from Jacques Pépin to Jean Vergnes to Ed Giobbi to Roger Fessaguet, among others from around the world, were frequent guests. Summer afternoons were spent seining for white bait, fishing for striped bass and bluefish, checking lobster and eel pots on Pierres boat the Billi Bi" or playing boules with family and friends. Cooking was for Pierre both a passion and a form of relaxation. In the mornings, he would be seen at the local market near his East Hampton home, often accompanied by his Brittany spaniel Kiki or Labrador Retriever Luc. He surveyed the fresh vegetables, consulted with the butcher, stopped at the local fish shop, all the while dreaming up his recipe for the day. 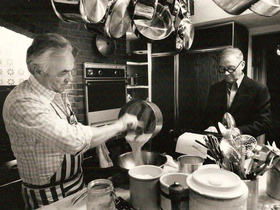 Beginning in the early 1960s, Pierre and Craig participated in East Hamptons annual Fishermans Fair serving moules marinières, clam chowder and crêpes. Long lines formed by hungry fair goers waiting to be served by the famed duo.